Going on vacation? Check out these top 10 travel essentials to help you pack! Getting ready to go on a vacation can be stressful for some and a breeze for others. I personally find it easier to pack when I have a packing list written out. 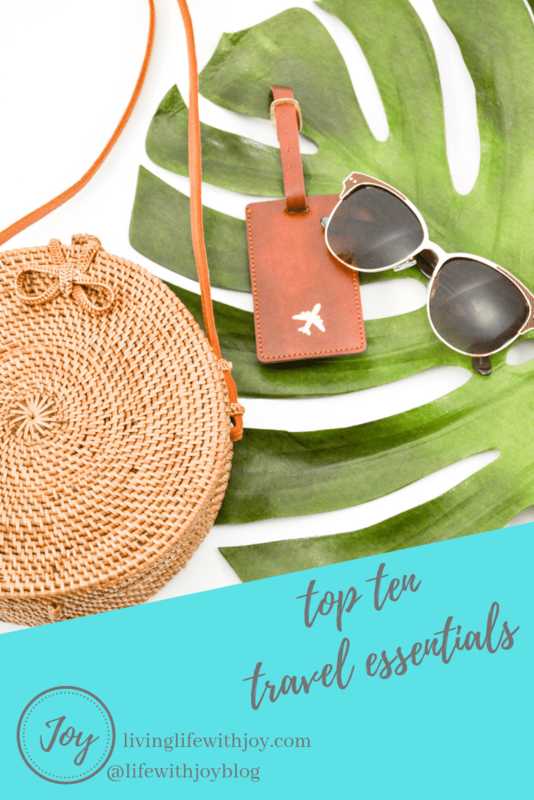 Inspired by a cute passport holder I got recently, I thought it would be fun to share my top ten essentials when packing for a vacation. Blog Post Updated March 16, 2018 with Amazon recommendations! If you’re planning to travel internationally, you’ll want to make sure you have a passport holder. Even if you don’t have immediate travel plans it’s always a good idea to have your passport up-to-date. Keeping everything in one place makes life so much easier when you only have two things you ABSOLUTELY don’t want to lose; your passport/wallet and your phone (duh!). And when the holder is this cute, who wouldn’t want to be seen carrying it? Accessory Insanity has the cutest passport holders and they offer free shipping on orders over $100 if you live in the US or Canada. These little guys take up almost no space and weigh next to nothing but they pack a major punch when it comes to organized packing, and they make it so much easier to stay organized. I got mine on amazon after my sister suggested them to me and they’re seriously the best! This is a 6 pack from Rusoji and includes 2 each of 3 sizes (small, medium, and large). It’s not something I would suggest using on a daily basis, but when traveling, these things make it so much easier to get ready in the morning because you can SEE everything! I got mine from Target and I put all my makeup, makeup brushes, and toiletries in this when I travel. Tip: in order to make sure you don’t forget anything, pack this up a day or two before you leave. Get ready in the morning as usual and you’ll know if you forgot something you want/need on a daily basis. 4. Travel storage containers for liquid skincare and makeup. Chic – squeezing a small amount of said products into a handy travel container. I used to re-use the small containers from the cosmetic counters from samples, but now Sephora sells a 3-pack that’s clear and easy to clean. I can’t go anywhere without my iPad if I’m going to have more than 30 minutes of downtime. The best part about the e-reader is that you can store countless books and magazines for your reading pleasure. Sure, there’s nothing quite like holding a real book, but when traveling, my iPad makes my life so much easier! Makeup remover wipes eliminate the need for extra items such as makeup remover, and tons of cotton pads. These wipes make getting ready for bed easy and sephora carries a line that are moisturizing and exfoliating. Double-duty from one product equals travelling win! If you’re anything like me, you’ll get cold at some point while travelling. Whether that hits you while waiting for your plane, on the flight, or in the hotel you’re staying at, it’s a good idea to bring something to keep warm. Bring something that’s comfortable on the plane but will also come in handy when lounging and getting ready on your trip. I got this ModCloth blanket scarf in a recent FabFitFun box, so amazing! This should go without saying in today’s world of travel and technology, but you should invest in sturdy luggage that has 360 degree rotating ‘spinner’ wheels for easy transportation. Falling asleep on a plane is a breeze when you’ve got a sleep mask with you. I could fall asleep just about anywhere, but a sleep mask gives that extra comfort and blocks out the light. I personally sleep with one almost every night. It also doesn’t hurt that they come in really cute styles and prints! I got this cute kitty sleep mask from a local TJ Maxx. There’s nothing worse than being stuck on a plane with dehydrated lips. I always bring at least two of my favorite lip balms in case I lose one while I’m away. My favorite go-to pick is the Sugar lip balm line from Fresh. A go-to knit dress: These little babies are super packable and you can take them right out of the suitcase and be ready quickly. You can dress them up or down depending on the accessories you pair with it, and it can always be worn with tights in cold weather. You never know when you’re going to need a dress and I always think it’s better to be overdressed than underdressed. If you’re checking your main luggage make sure you have a minimum of one outfit in your carry-on bag and a few pairs of underwear just in case the airline loses your luggage. If your hotel has a pool or jacuzzi, or if you’re going somewhere with the possibility of ending up at the beach, make sure you pack at least one bathing suit. If if you’re not planning to swim, you never know when you might end up in the water and wishing you had your suit with you! I know this is really hard for some of us (and I’d be lying if I said I wasn’t one of those people) but don’t overpack!! If you’re going away for the weekend, you don’t need five extra outfits on top of what you know you’ll need. Add one or two extra tops to pair with your pants will suffice. Same goes for shoes; unless you’re going to vegas for a bachelorette party, you really shouldn’t need 10 pairs of shoes. Limit it to one of each style that you’ll need; flip-flops, sneakers, evening shoes, done. I did receive the passport holder from Accessory Insanity free of charge in exchange for user feedback. My opinions are 100% my own and I was not paid for my review. Very nice and helpfull post. Thanks for sharing your tips! I usually don’t travel much but I’m making an effort to change that (it helps that my running hobby has me wanting to compete in races all over the country!). I’ll have to pin this post for my next vaycay! Lip balm is definitely my biggest must-have when I go anywhere! I swear, any little change in the humidity and air pressure, and my lips get chapped! And it’s something a lot of people don’t think about when traveling so I’m so glad you mentioned it on this list! Also, I literally always forget makeup remover wipes, which are great to have on hand even if you don’t wear makeup because they can double as a cleanser in a pinch. Also, I’ve never really thought about packing cubes but that is such a great idea! Such a useful list, thank you! The packing cubes are seriously the best thing ever! My mom finally took my advice on one of her recent travels and still can’t get over how awesome they are! The makeup remover wipes are super handy, especially with the liquids restriction. I would also add earplugs, once I took an 11 hours flight without them and a couple of babies were crying all the way, I couldn’t sleep at all. Great list!! That’s a great tip about the ear plugs. I wear hearing aids, so when it gets loud I can just take them out and not much bothers me! I feel like I always forget lip balm when I’m traveling and I don’t realize it until my lips are champed! This is such a fantastic list, I really like the travel size liquid contains and will pick some up next time I travel! This is a great post, I like all of those products you selected for this features especially the lip balm and the sleep mask because it is so cute! Nice list! I think things to help prevent and combat food poisoning (especially if you’re going somewhere abroad) is very important. I never leave he country without my full spectrum probiotic. And some electrolyte packets are also important to avoide dehydration ! Ah yes! I love my big scarf that is also the skinniest blanket but works for airplanes! Also the packing cubes are so beneficial, everyone should have them! I’m all about the scarf using as 2 in 1 – as a blanket as well haha! Always carry one with me everywhere I go! Very helpful post and very timely too because I am travelling to Zambia for a month and I must admit I over pack….I pack for all seasons. The first plane ride I ever went on I forgot chapstick and I was MISERABLE. Never again hahaha. The scarf tip is so good! I’m always freezing. I am going on a trip soon so this was a great list. I will have to buy some travel cubes to use in my luggage! I’m an avid traveler and wow the 360 rotating wheels luggage has made all the difference in my life LOL! Definitely a game changer and worth the investment! Love the idea of the packing cubes I’m constantly trying to fit a lot in my suitcase since when I travel it’s for extended periods. These would be a life saver! I can not even sleep without lip balm lol but I may have a slight addiction. I love these tips as I never heard of a luggage spinner and I think having a passport holder is the safest bet I am always worried that I will lose it when I travel. I will also try not to pack my entire wardrobe like I usually do. That sleep mask is so cute! I sleep with an eye mask every night also. I also pack with a list, so much easier and more organized. Love all of your suggestions! Wow! Such a great post! I really appreciate it because I didn’t know about most of those items! I went overseas many years ago, and am just beginning planning an overseas excursion again, so this is so timely! Not to mention just for domestic trips! I’m keeping this post in arms reach!